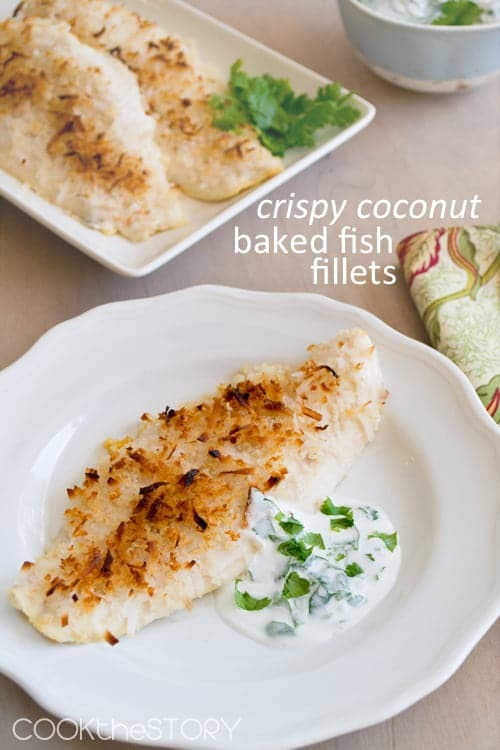 Crispy Coconut Baked Fish Fillets are a quick and tasty. Perfect for a weeknight meal. But then, there’s a coconut-cilantro sauce that makes them special enough for company. 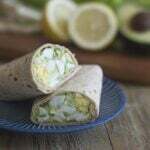 I partnered with Stonyfield Yogurt to bring you this recipe. Spring is here! And with the hope of hot days ahead my mind has drifted to tropical flavors. And so, this week I’m bringing you two tropical recipes. Today it’s Crispy Coconut Baked Fish Fillets. Later in the week it’s Tropical Breakfast Skewers. These recipes will definitely bring sunlight into your days. I really love coconut shrimp and I’ve played with doing healthier baked versions at home. But coating each individual shrimp was a bit time-consuming. So I decided to use the coating on something bigger to save time. Coconut baked fish fillets were born. You can use tilapia or any mild white fish fillet. My kids really like this dish, I think because of the bit of sweetness from the coconut. 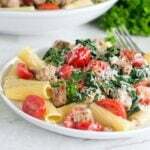 I ususall make it as a quick weeknight meal because I know they’ll eat it. But I also served these fillets when friends were staying with us for a few days. 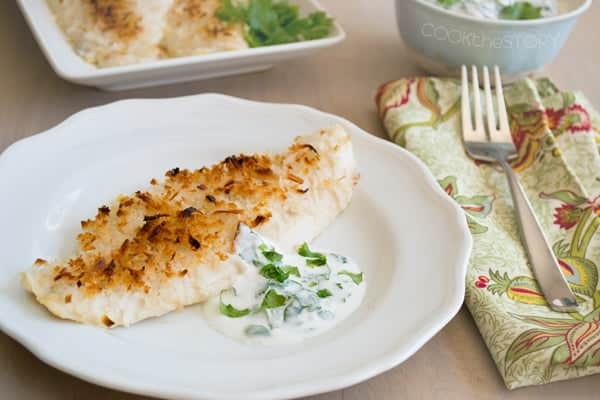 The coconut coating and the coconut-cilantro sauce (made from coconut milk, Stonyfield Greek yogurt, cilantro and lime juice) turned the otherwise simple fish, rice and broccoli dinner into something special. Looking for more easy fish recipes? I have info about how to cook fish from frozen over here. It’s so convenient for busy weeknights. And here’s a delicious recipe for Buffalo Sauce Cod with Fettuccine in Ranch Alfredo Sauce. 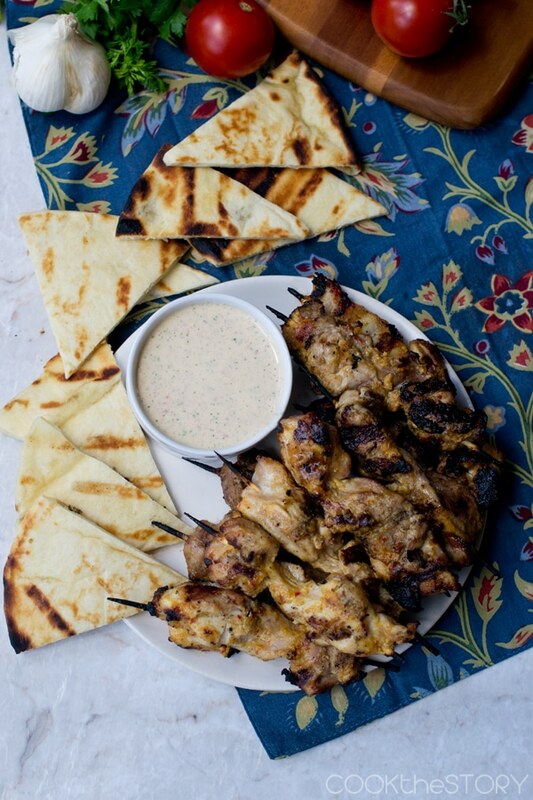 Another great way to use yogurt in your dinner is with this recipe for Indian Spiced Grilled Chicken with Yogurt Sauce. 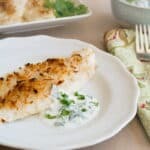 This baked fish recipe is easy enough for any weeknight but the coconut-cilantro sauce makes it special enough for guests. In a small bowl combine the panko, shredded coconut, vegetable oil and remainig 1/4 teaspoon of salt. Sprinkle 1/4 of the crumbs down the middle of each fillet and then use your fingers to flatten and spread it, coating the top of each fillet. Bake until well browned and cooked through, 10-12 minutes. Disclosure: I am a brand ambassador for Stonyfield meaning that they pay me to promote their products. All opinions are my own. Thanks for the this great recipe! Just to be clear, should the lime juice and cilantro be added before or after refrigeration? I think the recipe says both. I love coconut shrimp and never thought to put it on tilapia. Thanks. 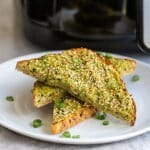 Salt, pepper, paprika, panko and lemon juice are my staples but I am going to try this next time. We have been eating a ton of fish lately and the flavors in this sound so fresh! Love it, Christine! This sounds divine… Once I can start eating fish again I’m totally going to try this recipe. Love this simple fish recipe Christine! I’ve been making lots of fish this week, so I’m always looking for easy recipes. Would love it if you shared this in my community forum – you can link to your post there (http://community.jeanetteshealthyliving.com/). Someone was looking for easy fish recipes the other day. What a perfect dinner. I’ve a family whose love of fish is only eclipsed by their love of coconut. Pinning RIGHT now.